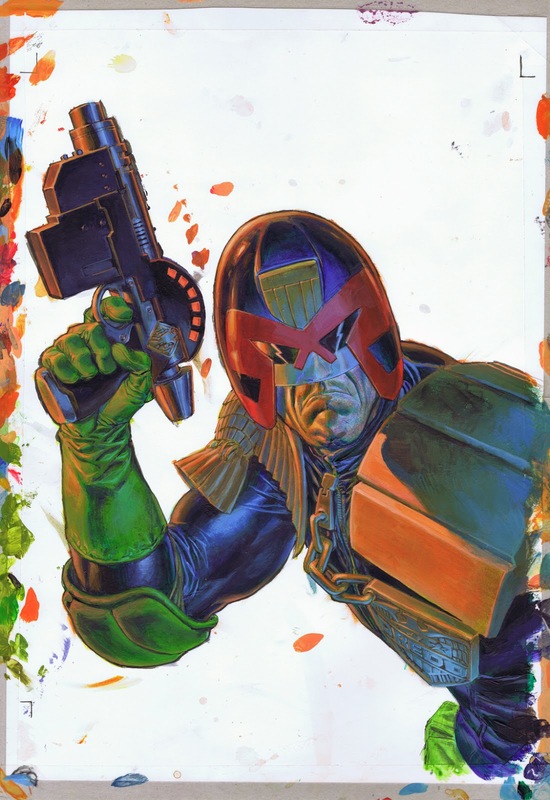 Phil Winslade - Dredd for the Win! 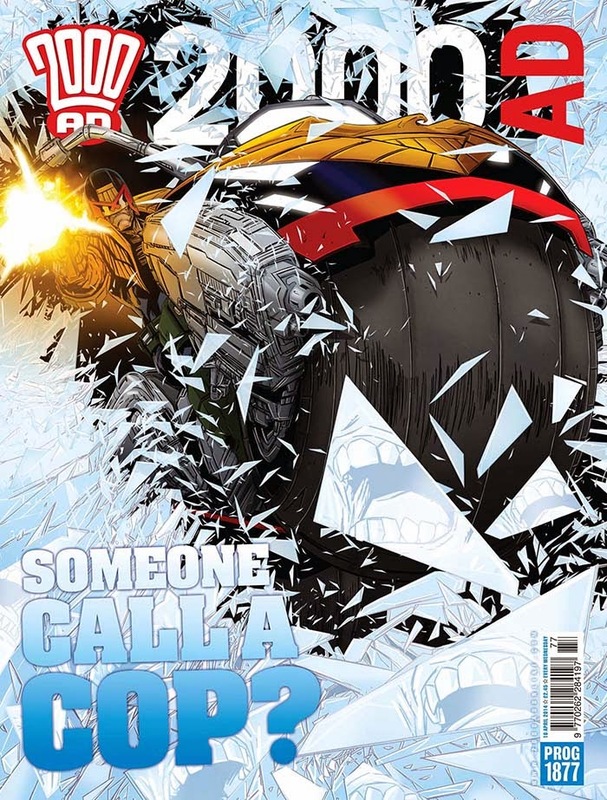 The mighty Phil Winslade is back with his second Dredd cover in just over a month and it's a cracker! 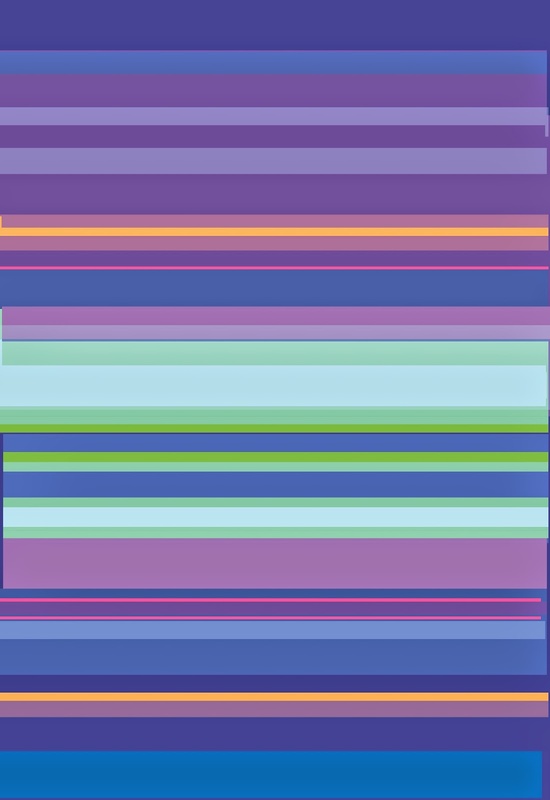 Those colour choices are fantastic, the cover gives a real expressionist or abstract art kinda feel, very classy indeed! The artist was kind enough to talk us through his process, over to Phil "I actually did the cover at the same time as my Meg one. Tharg liked two of the six ideas I had and commissioned both. 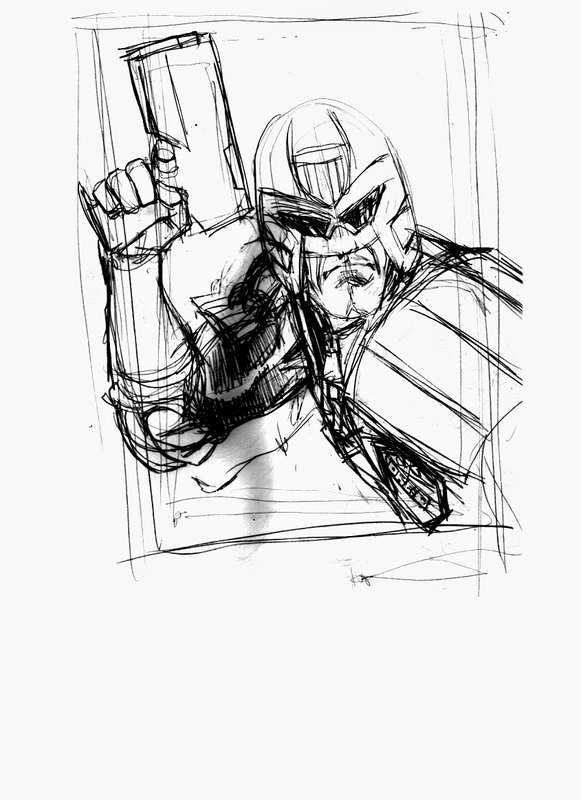 Here's my initial sketch..."
Dredd stars in the new 'Sure for Men' deodorant advert. 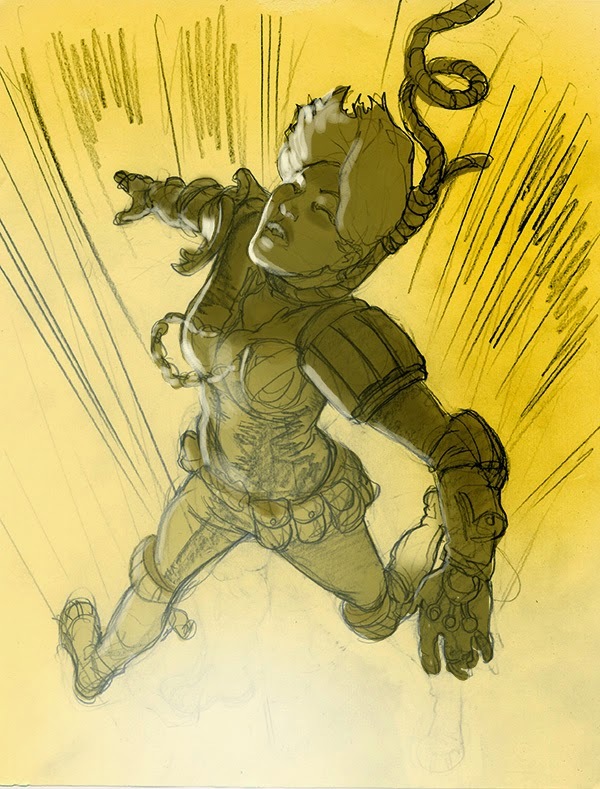 "With the image commissioned I went on to do the rough copy-tonal sketch below." 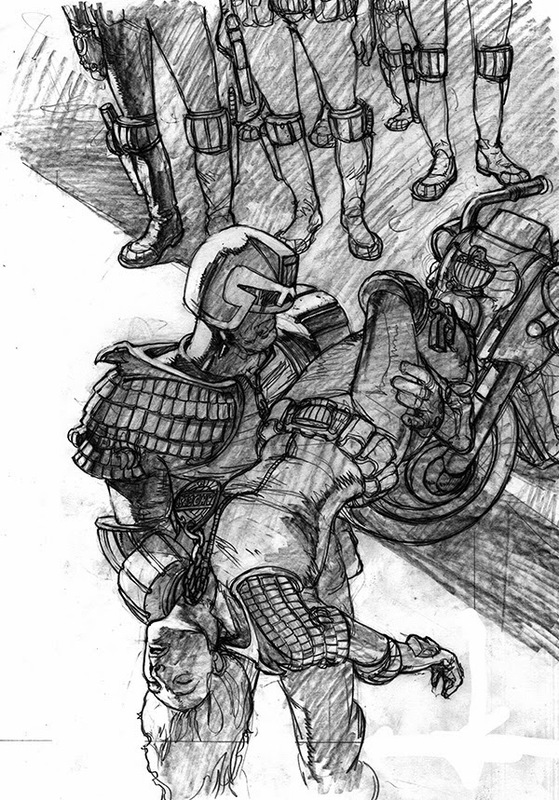 "Next, the cartoon which I painted on..."
Sheesh, Dredd's arm must be getting tired by now. Here's a scan of the image as Phil was painting it, absolutely beautiful! 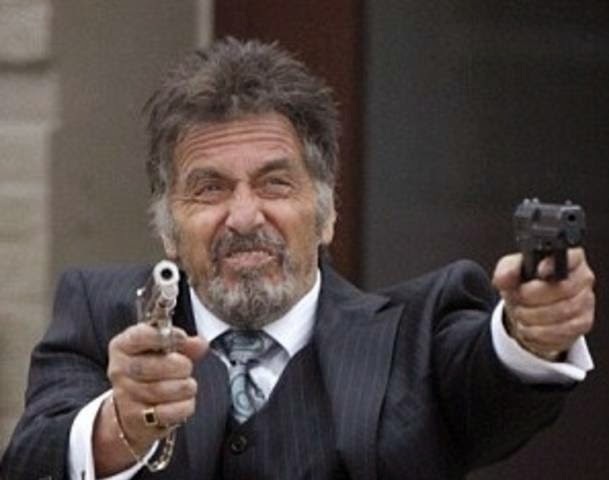 Who's gonna mess with him? Next Phil talks about that arresting (no pun intended) background, he says "The background palate I worked out on Photoshop. I wanted the background to be more inference than actuality (using the Akira-style speedlines but inferring streetlights and buildings in an abstract, impressionistic way so that the momentum wasn't lost)." Like many of the artists who contribute to this blog, Phil is known to worry about the colour balance of his scanned image. He says "I've probably over-compensated when editing the scans - what you have as a painting is not what you get as a scan and the color balance shifts and hues are very hard to recover. Until you see it in print you can never be sure how the process will affect what you do." Well I for one don't think Phil has to worry too much, it looks pretty damn prefect to me! Below is the finished cover, fab! Huuuuge thanks to Phil for sending the images and fascinating process notes. 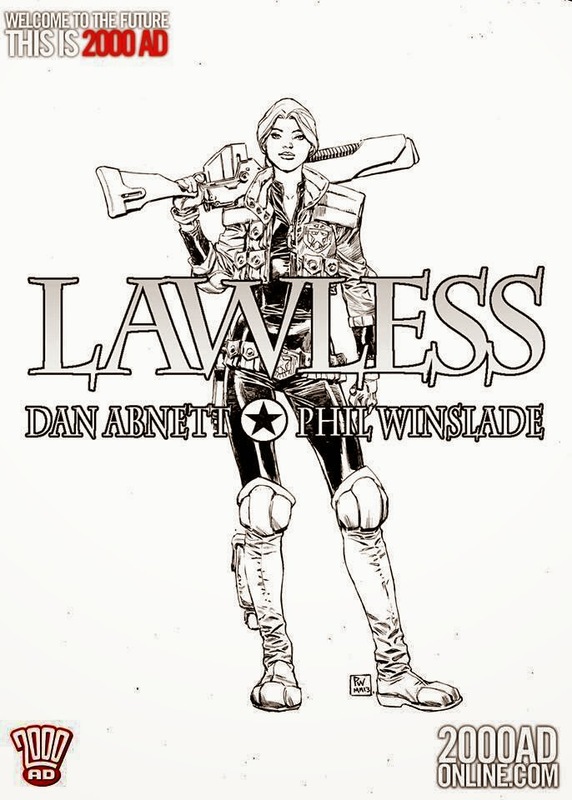 We'll be seeing lots more of his excellent work later in the year when Lawless hits the Megazine. 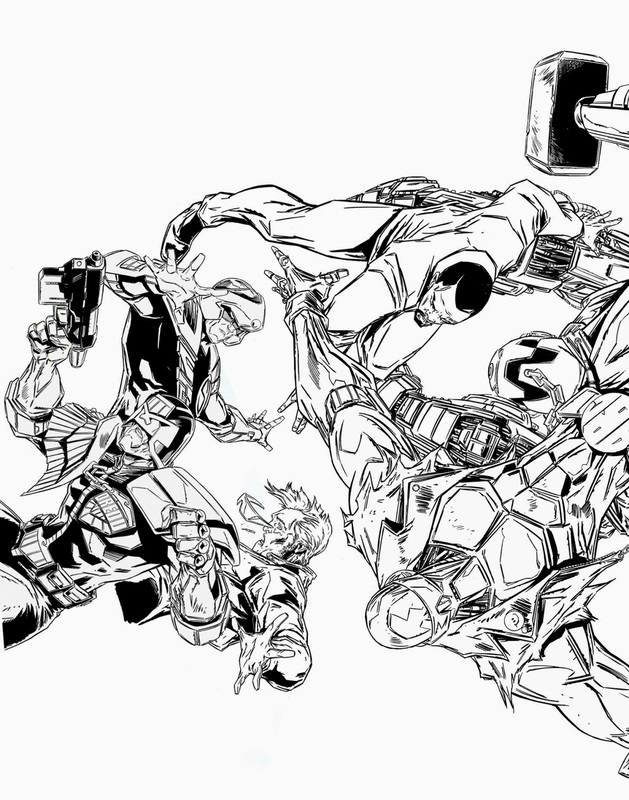 The story is written by Dan Abnett and features, much to his relief, black and white art work by Phil. Can't wait for that! 2014 Easter Special - Ben Willsher's 2013 Christmas Prog! Merry Christma... I mean Happy Easter! 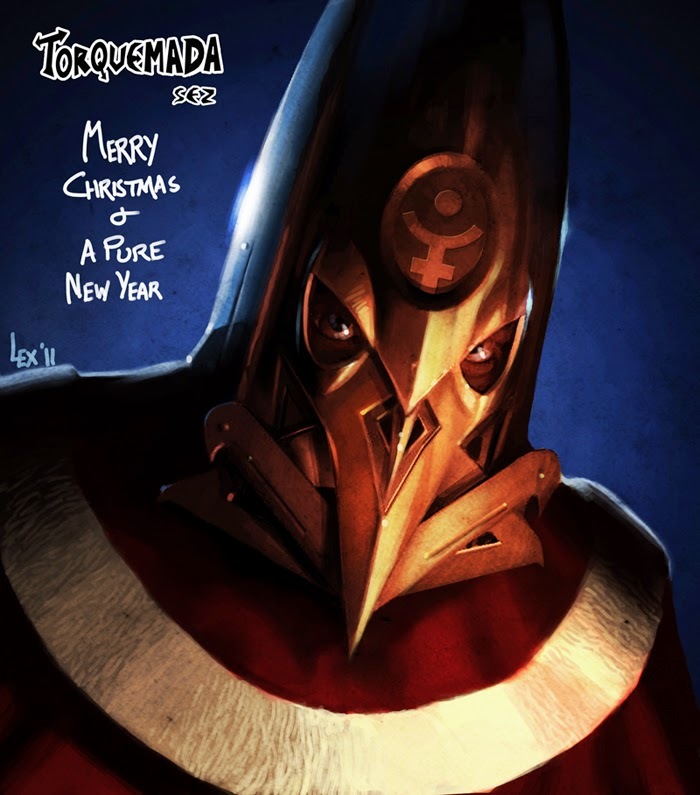 Following a disaster at the Trans-Time Corporation, Ben Willsher's zarjaz cover for the Christmas Special was sucked into a wormhole, sent to Halloween, rerouted to Valentine's Day via Mother's Day before being passed on to Pancake Tuesday. Fortunately, crack time commandos were able to retrieve the errant cover and deliver it to Covers Uncovered HQ in time for Easter - Phew! 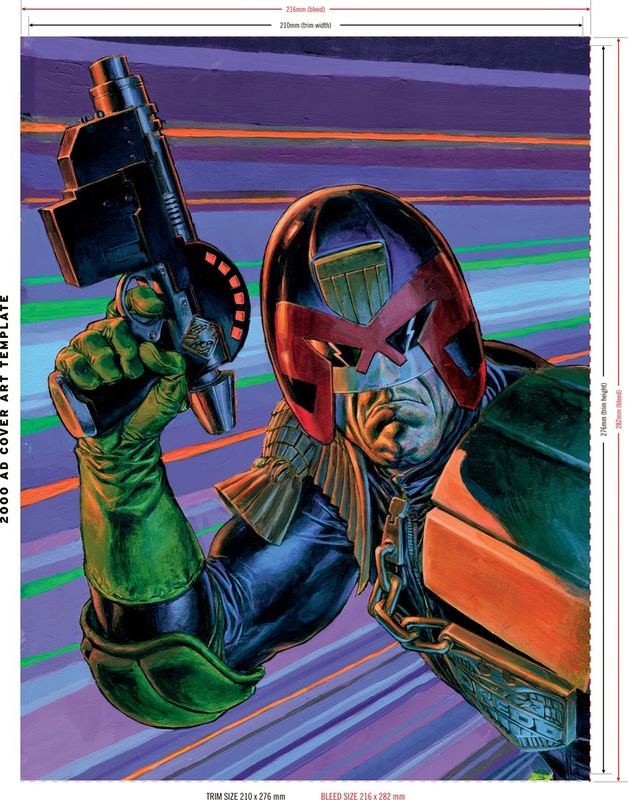 "Tharg had asked for a 'cosmic' image of himself that was in a similar painterly style to my close up Dredd head of prog 1802"
Ben continues "I wanted to include some of the characters that would also appear in the end of year prog. I first toyed with the idea of maybe being able to see the characters from within the Rosette of Sirius itself, but there was something that just didn't feel right having them trapped, or held prisoner within the TMO's bonce... So it was back to the drawing board." "I roughed out some more images and felt much happier with the idea of the them being blasted out of of the Rosette instead. I was also conscious that this way even if the Prog got stuck at the back behind other publications on the magazine racks, you would still be able to see the main protagonists." 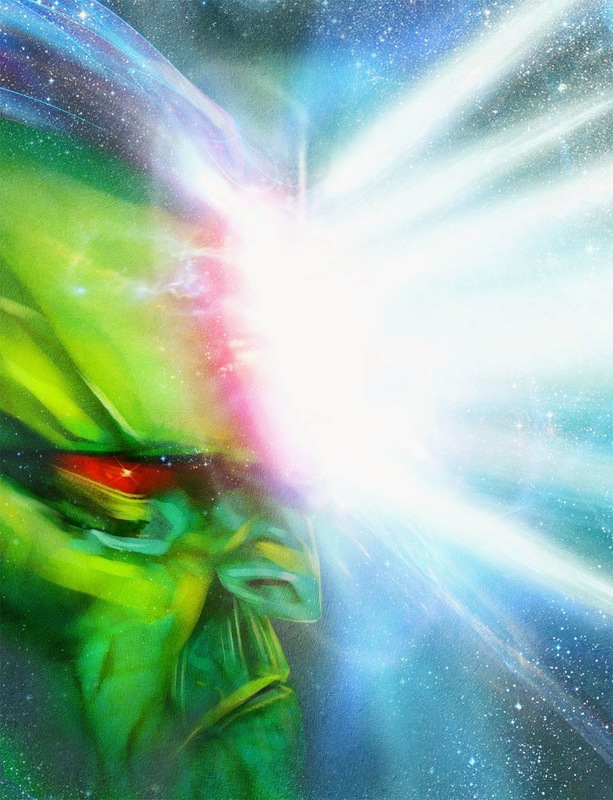 That's what it looks like when Tharg gets a migraine. "Then Tharg Okayed the revised rough..."
"I set about painting the real thing. I was keen that my image of Tharg had the traditional look, with his long upper lip and philtrum." 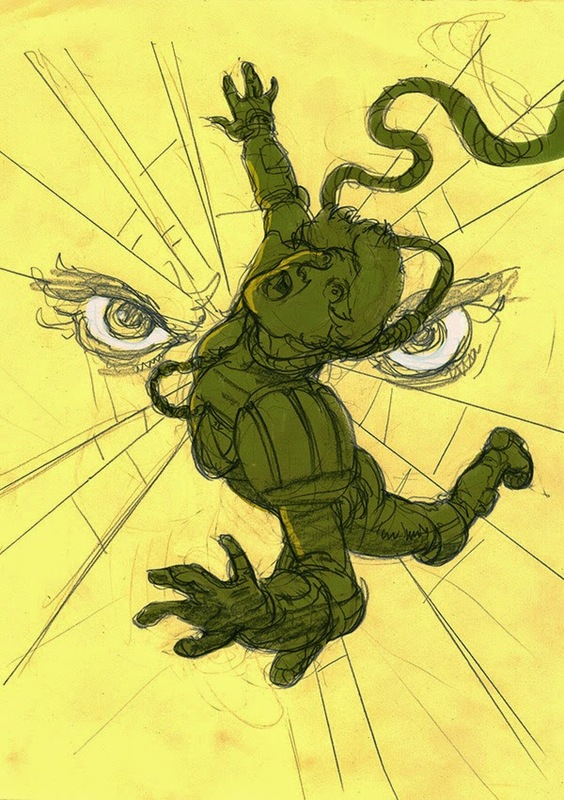 "The art itself was drawn in two parts. 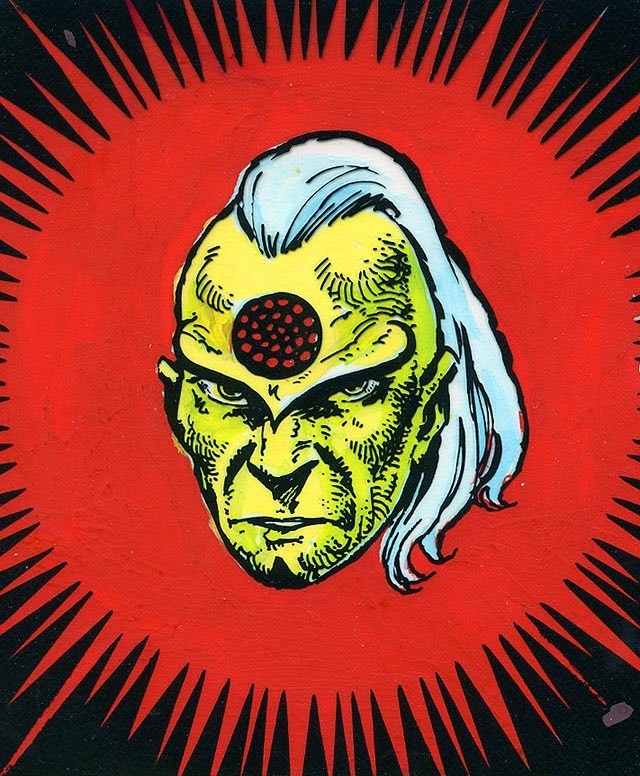 The Face of Tharg was painted directly in photoshop with a cintiq (blody show off - Pete) and the characters were hand drawn traditionally, then coloured . I really wanted to make sure that both elements looked different from one another, so that the characters looked artificial as if they really were constructs from Tharg's imagination!" "Oi Ro-Jaws you nerk! 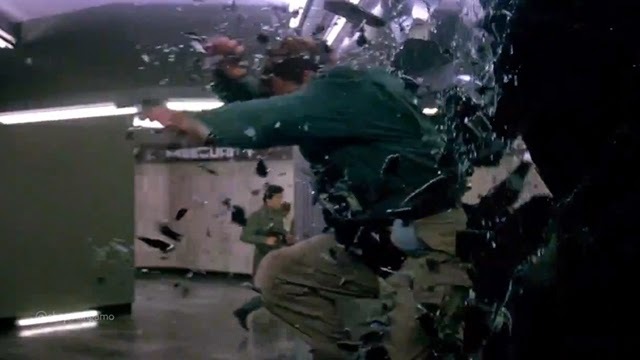 You forgot the 'Wet Floor' sign again!" 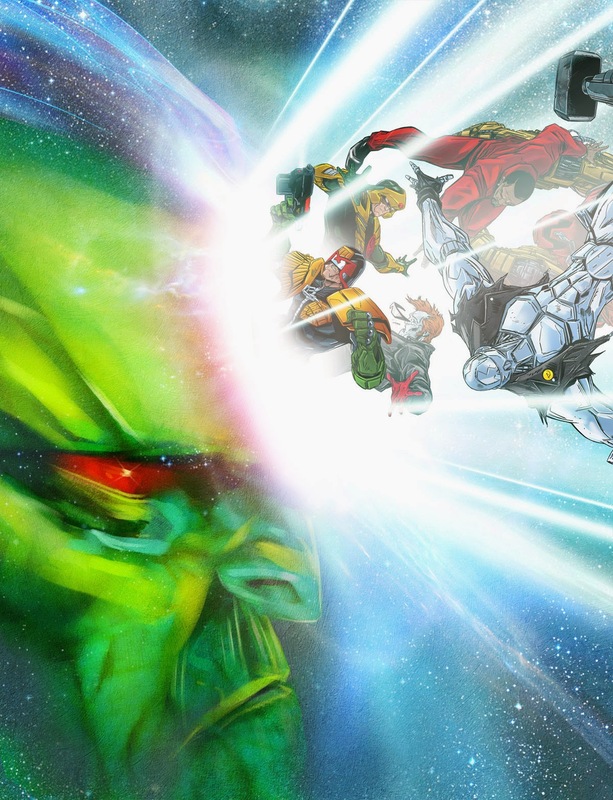 "Finally I merged the two images and added extra FX"
"Tharg, you've got your full beams on!" And that's how the Christmas cover was made! Galloping great thank you's to Ben for his prompt(!) sending of the images! Just joking folks, Ben had sent 'em, they'd just got stuck in his inbox, which sounds very painful. 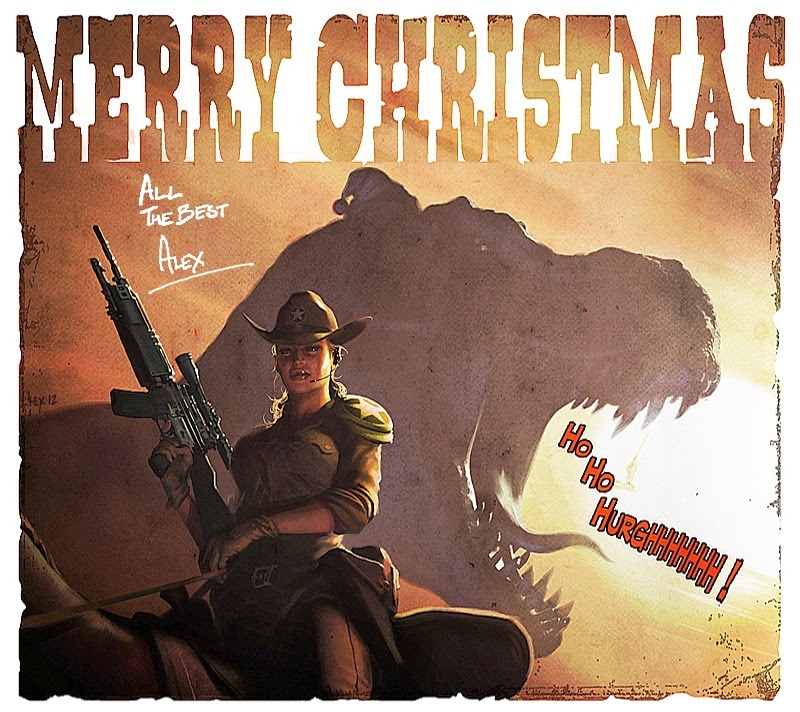 All that's left to to wish you all a Merry Christmas, I those that Santa brings you lots of erm... chocolate eggs! Ben Willsher - Crash! Bang! Wallop! 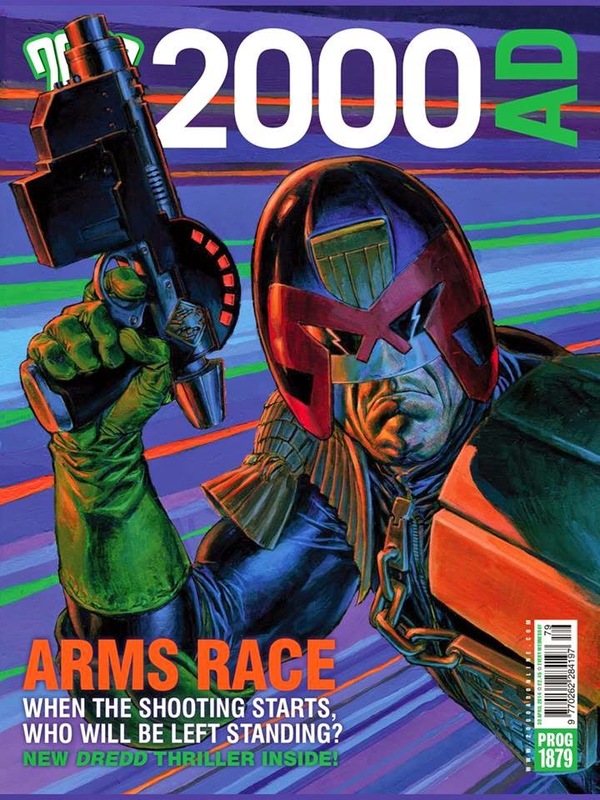 Over to Ben to tell us about this beauty - "This cover came with a simple request request from Tharg- "Dramatic image of Dredd on Lawmaster, shooting at reader..." That was enough to get my art circuits whirring." 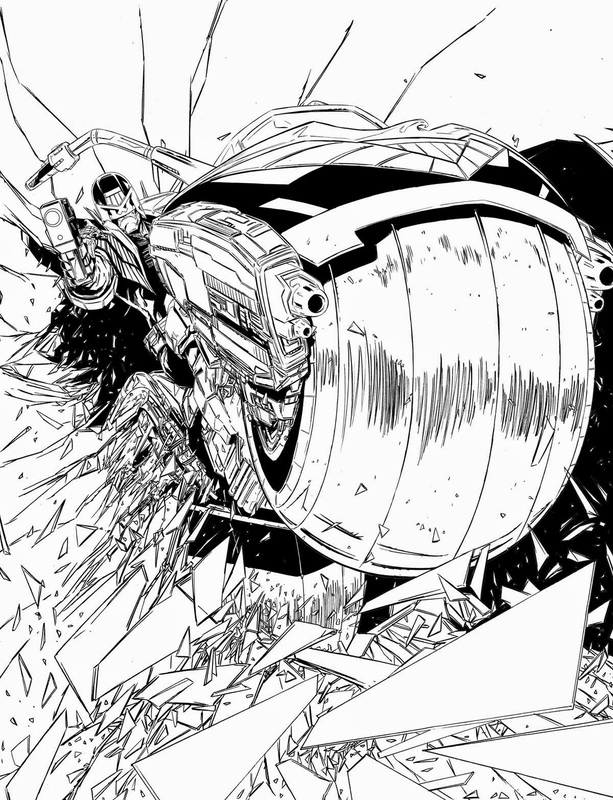 "I wanted something striking and bold and thought that maybe Dredd smashing through a window would hit that target. 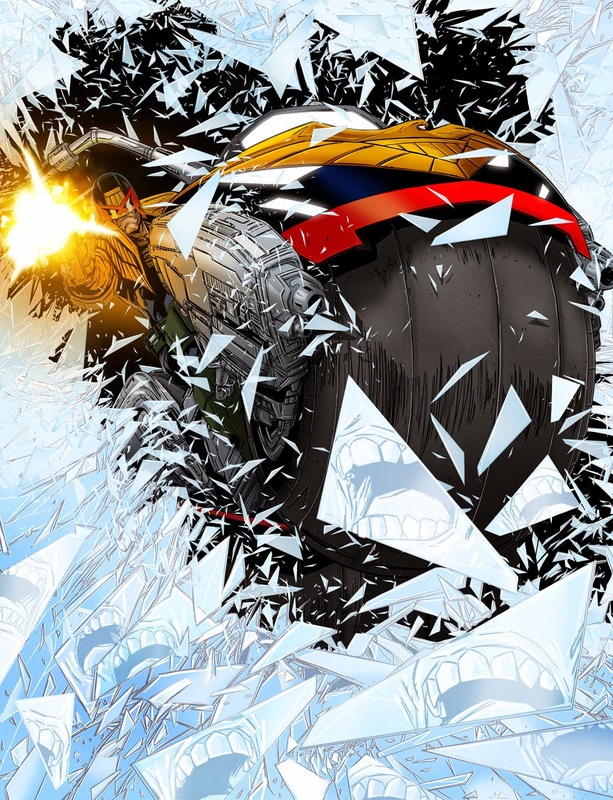 I remember how stunning Carlos' very first image of Dredd was in the unpublished story BANK RAID..."
Ben continues "Lots of smashing glass wasn't enough make it as dramatic as I wanted, so I added the reflected image of the victim being shot as way of telling a whole story, and that Dredd's Standard Ex had found its target. 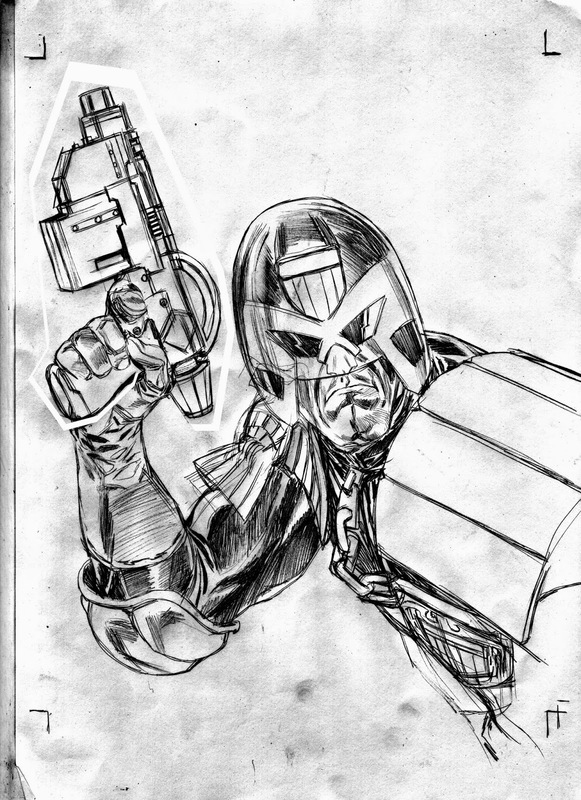 I drew up a rough... "
Buy Megarest Double Glazing Plastiglass - so tough only Dredd can smash it. 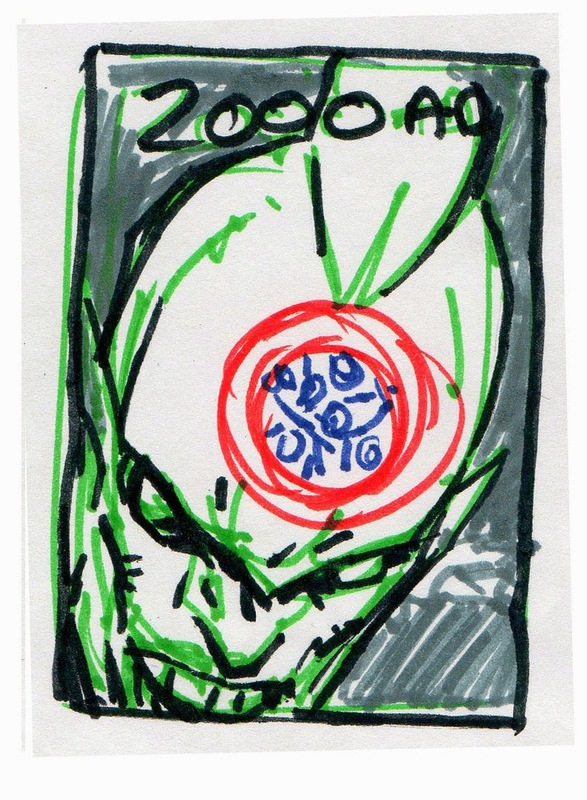 "Once Tharg had approved it, I started on the finished inks. 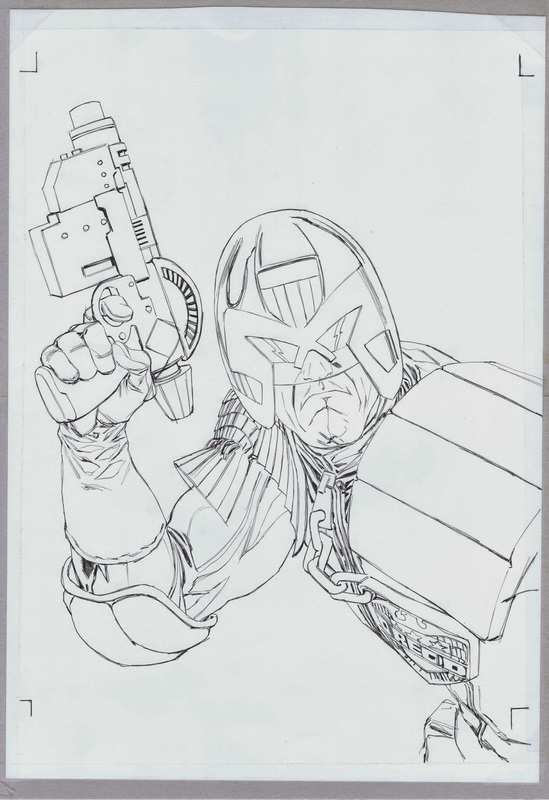 Over all I was pleased with the initial rough, but felt that with some tweaking here and there to adjust the scaling (Dredd was far too big, and the front of the Lawmaster was far too small) it would be much closer to the final image I wanted to achieve." 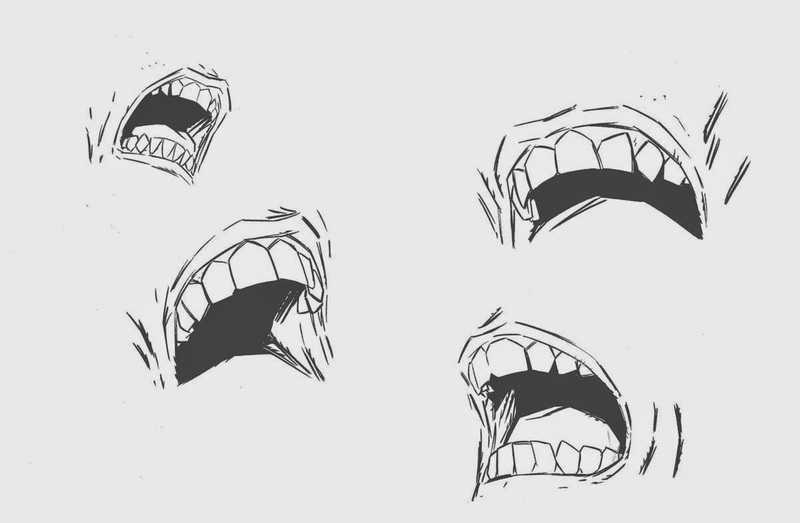 "Next was the overlay for the screaming mouths..."
"Then it was onto the colouring stage. I always knew I would add extra shards of glass whilst colouring, but as you'll see the background changes at the top from the Black and White to Coloured image, as I felt the cracked glass FX didn't have enough impact, so more shattering glass was added in post production (as they say.)" 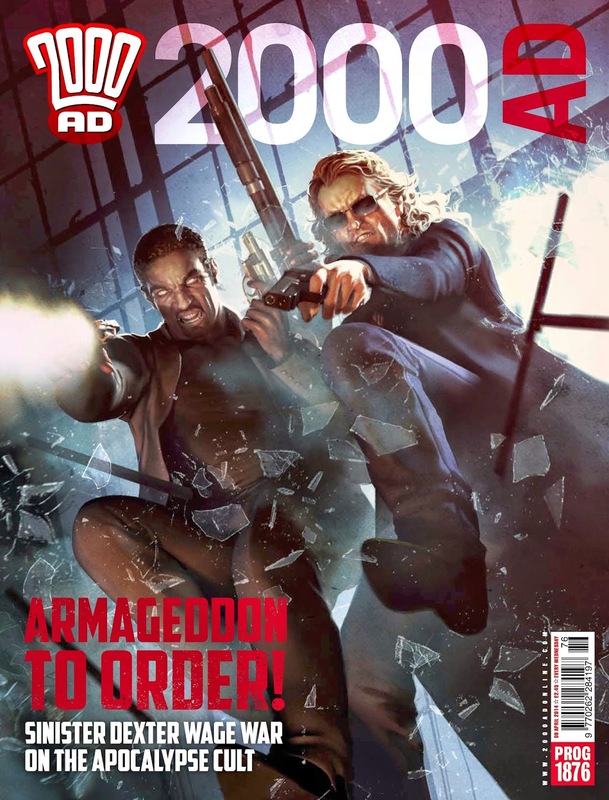 And here's how the Prog appears in Tharg's Future Shop, fantastic! 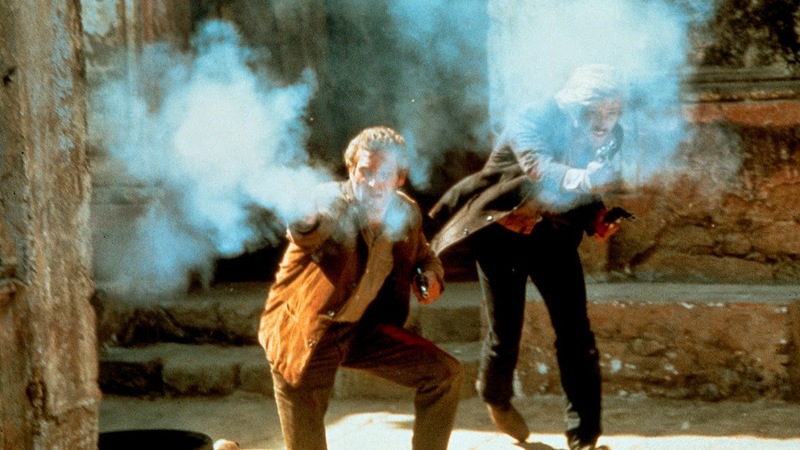 Simon Fraser - Hung Jury! Sniff! 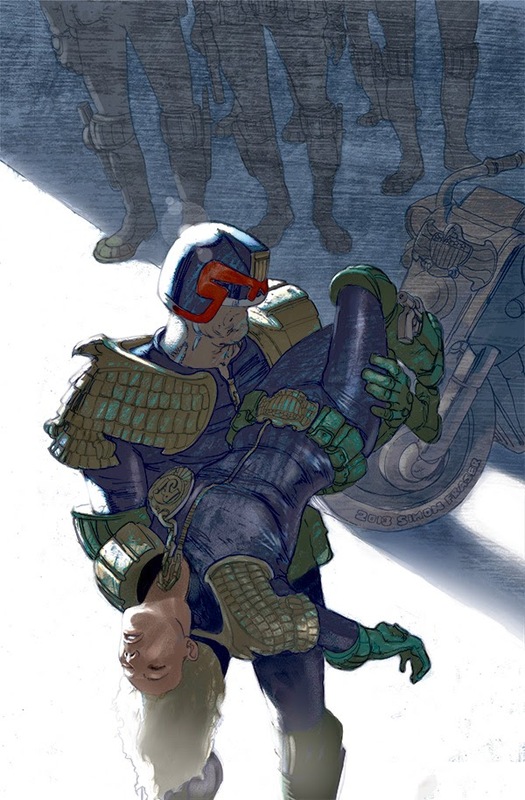 No stranger at tugging at our heartstrings, Simon Fraser delivers this emotional shocker as Dredd cradles the corpse of the recently deceased Judge Anderson in his arms. I absolutely love this, it's such a departure from Si's usual style, the grittiness and muted colours match the subject matter absolutely perfectly. 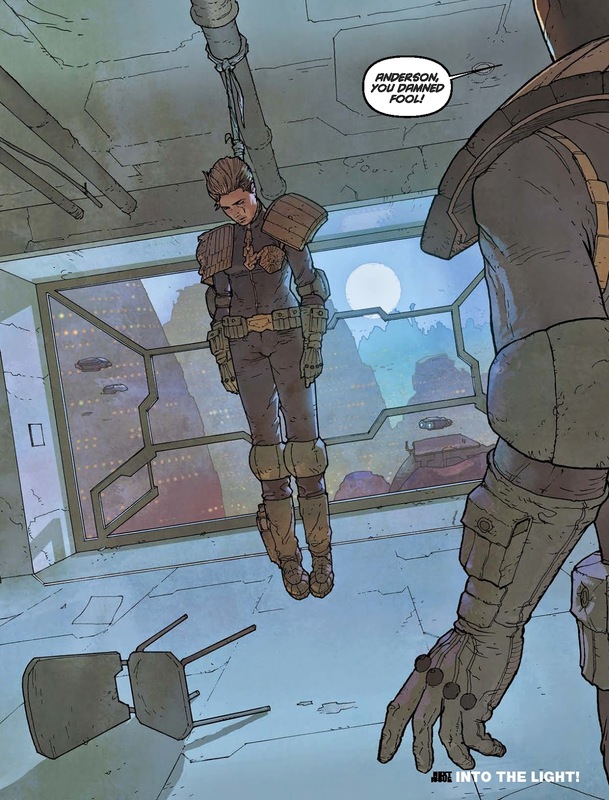 As regular Megazine readers will know, poor Anderson has been plagued by morbid, suicidal thoughts of late. Is it trauma linked to her current case, the weight of suffering from the victims of the Day of Chaos or something more sinister altogether? Michael Dowling is doing a wonderful job on the interior art and I think Simon has complimented him perfectly. Here's the shocking final page from last months Meg which shows Anderson being a damned fool! 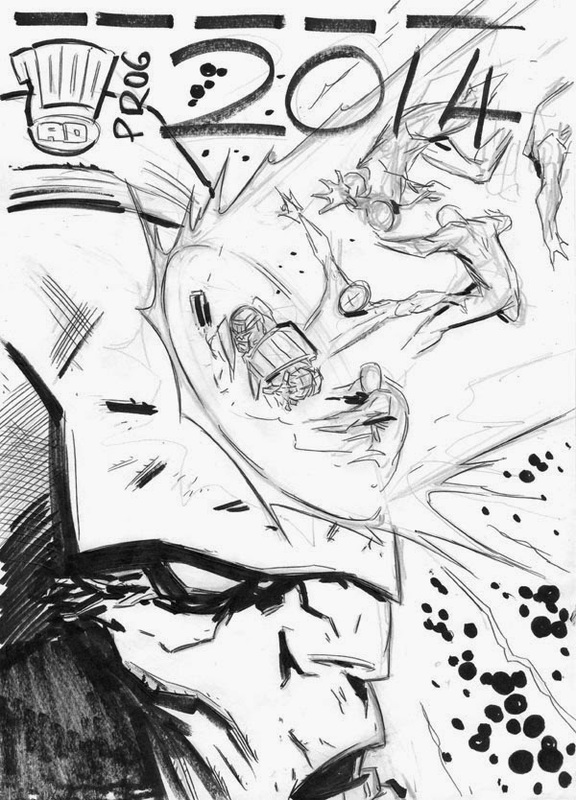 "So here are the first 2 sketches I did for the cover. They were more hanging-centric. 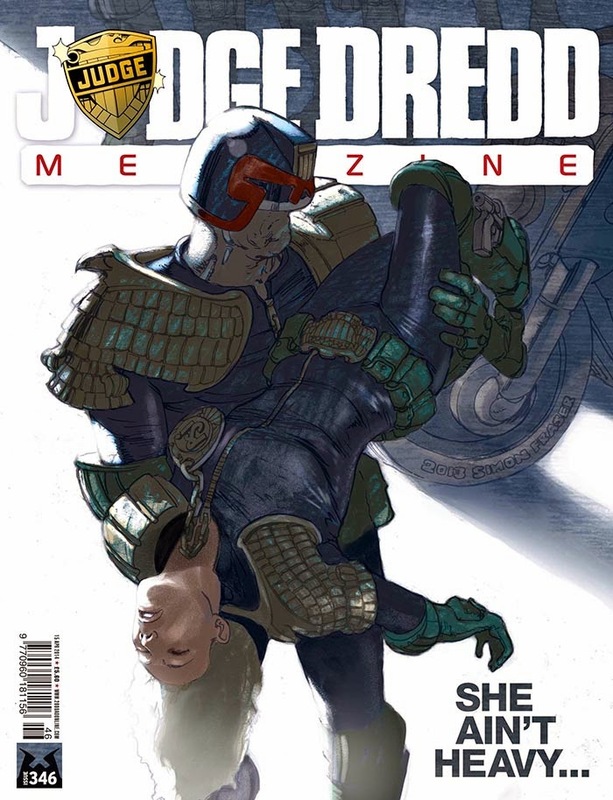 Then Tharg suggested that we do Dredd exiting the building with Anderson's body, which was a brilliant idea as it gives us so much more emotional resonance (and it echoes the Rico death scene by McMahon.)" Who's are those eyes then? Here's a reminder of that classic McMahon panel to stop you Googling! 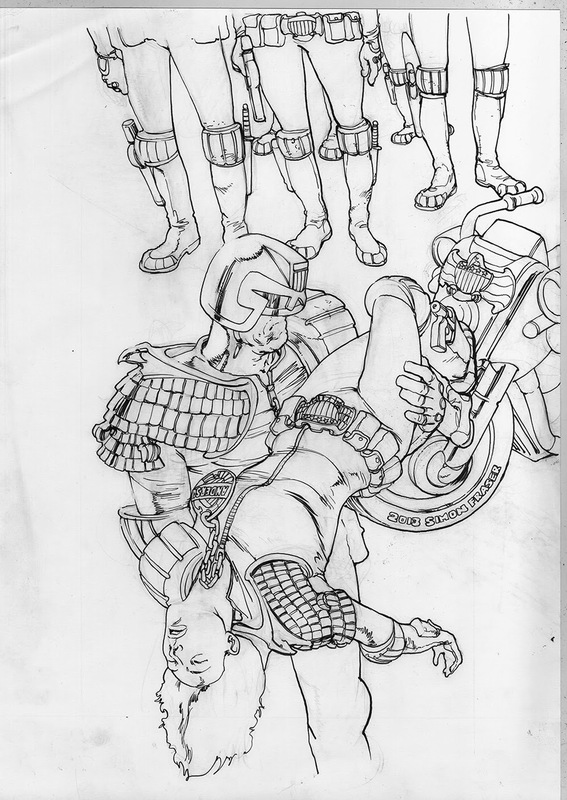 "Here's the pencil rough, then the full pencil version which I did an ink 'holding line' over. I then composited the pencil and the inkline together so as to keep the pencil texture grittiness." "She-she ain't heavy, she's my colleague!" "The colouring was all about keeping the gravity of the black and white image, by adding very muted colour and keeping a very high contrast. It printed darker than I expected, but that actually worked out well as it makes the image that much heavier. Unfortunately the other background judges don't show up much in the final cover crop." That's the reason this blog exists Mr F! Si's stunning use of colour, who needs Gary Caldwell eh? And Simon's last words "I'm happy with this cover. It let me experiment a bit and had a good bit of iconic power." We're happy too, truly a classic image that I reckon we're going to see again and again. 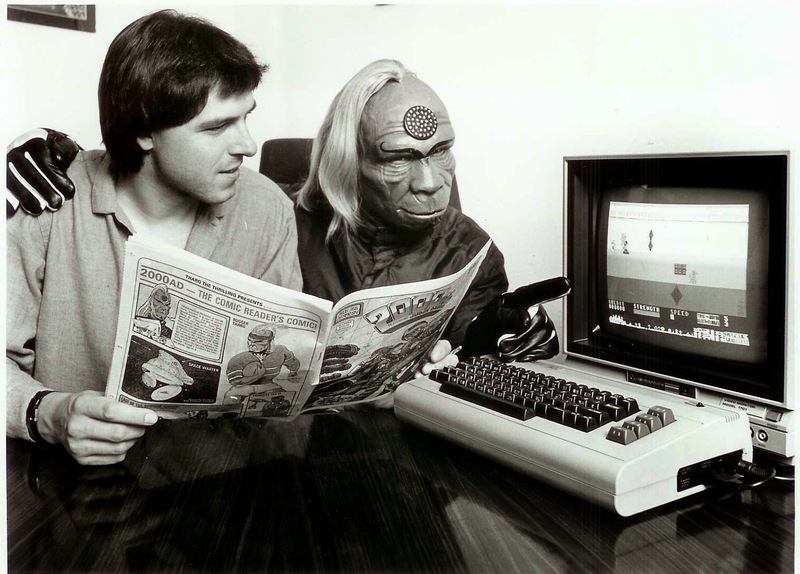 Thanks to Si for sending the images amazing images, it's great to see him back in the house of Tharg. Check out his newly updated site here! Alex Ronald - Jumping the Sharks! 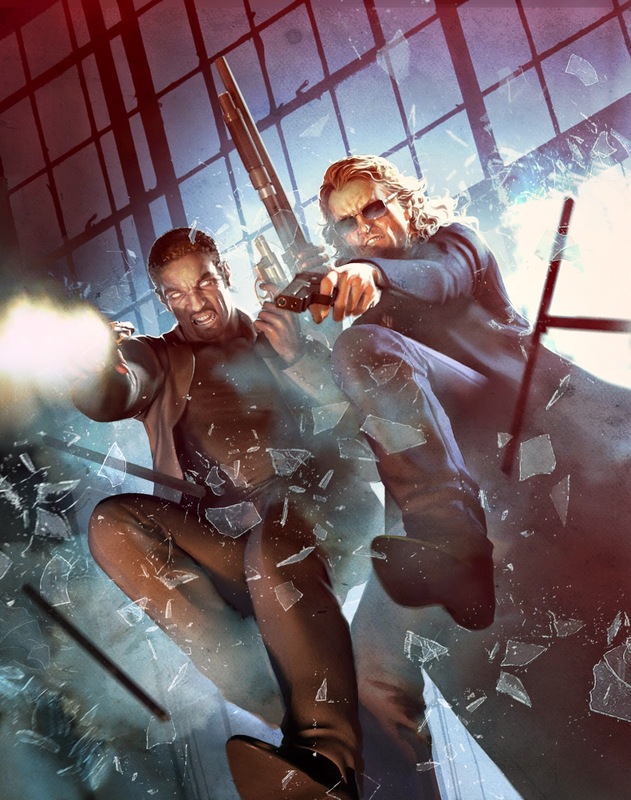 Gruff voice on... "Coming this summer... from producer Michael Bay... starring Jamie Foxx and Kurt Russell... get ready for... Sinister Dexter and the Bunch of Cults." What a funting smashing (ha!) 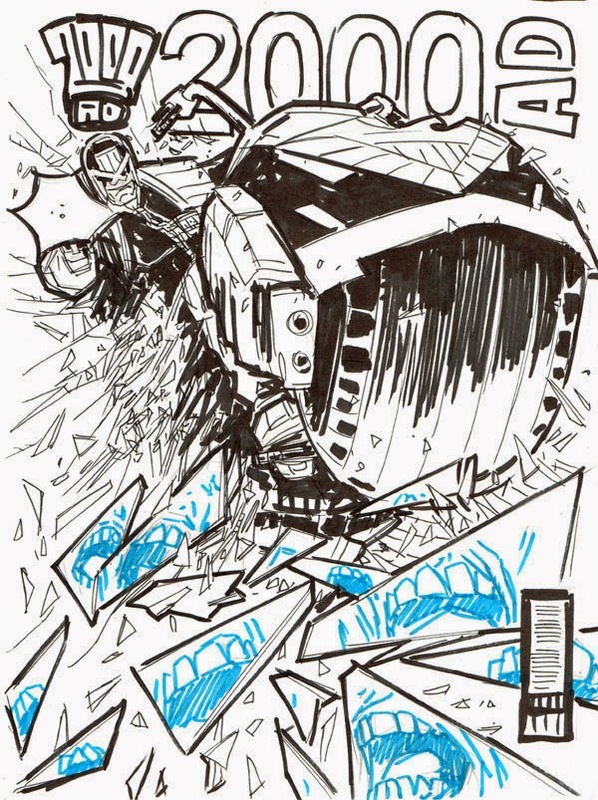 cover by Alex Ronald! I'm delighted to see the Vampire Vixens of the Wehrmacht artist back on my Prog following his outstanding Ulysses Sweet cover a few progs ago. 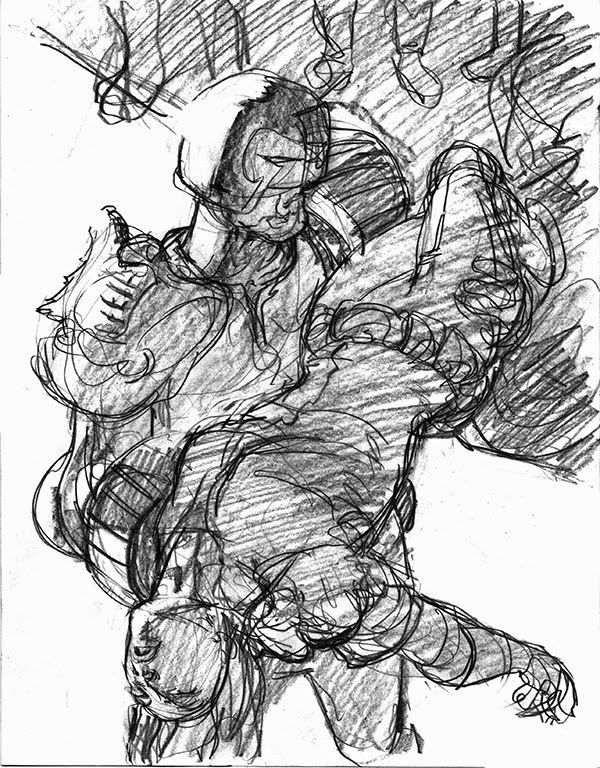 Great to see him tackling Ramone and Finny too, he's really brought the pair to life. 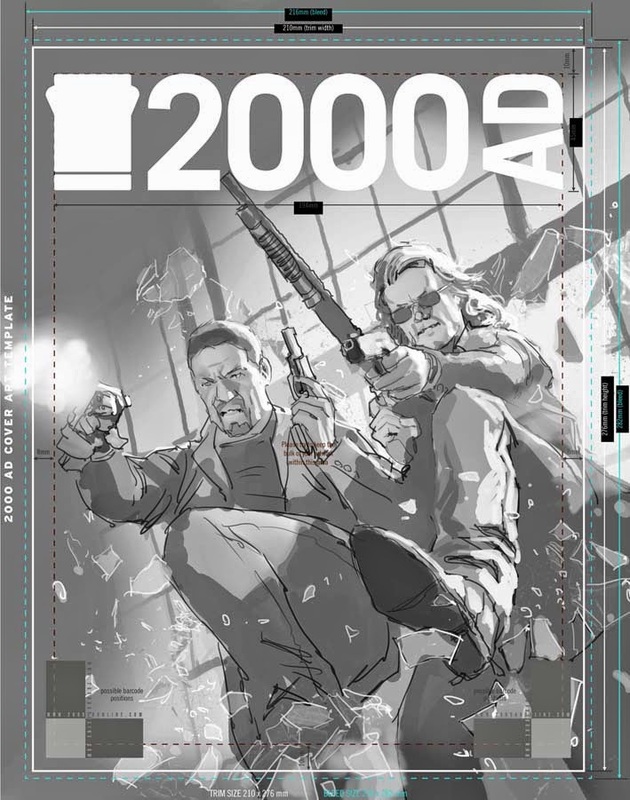 This is a fantastically cinematic image from the artist sums up the strip perfectly. 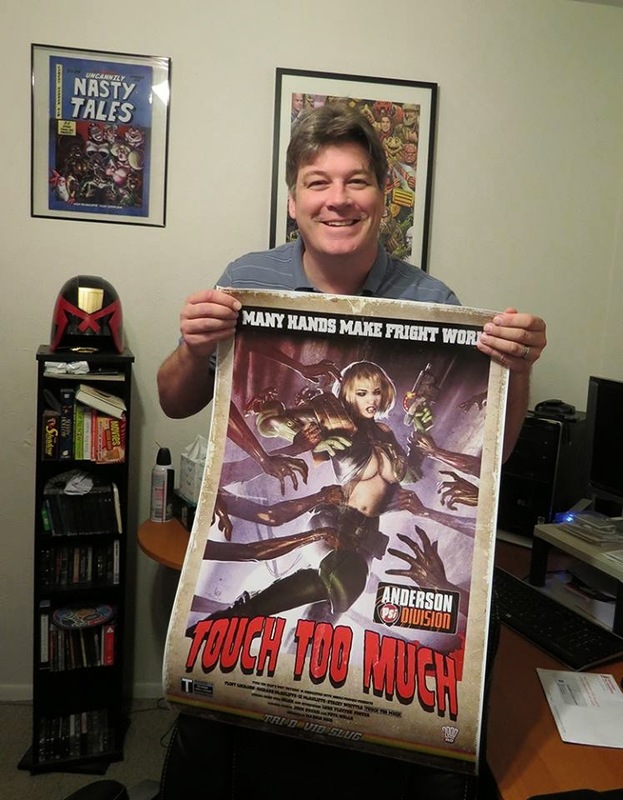 This was certainly the intention, Alex seeped himself in film nostalgia to construct the cover and included several movie reference images that he used for the cover, saying "All those teenage years watching crappy action flicks wasn't for nothing after all!" Wallowing in such classic movie nostalgia led to this rough black and white sketch (rough being Alex's words, not mine) showing the pair erm... stealthily infiltrating the compound of The Pastoral Collective of Generica. Disclaimer: Contents of the cover may not reflect story inside! Crash! Bang! Wallop! What a picture, what a photograph! Check out the credits for some familiar names - cunning stunts? The cheek! Here's Flint proudly showing off his print. There's only two of these in the world and I am lucky enough to own the other, thanks to Mr Lockjaw! Here is the man you've no doubt shout at on your iPod! Stench Be Gone - Does exactly what it says on the tin! You really don't want to get on his naughty list! 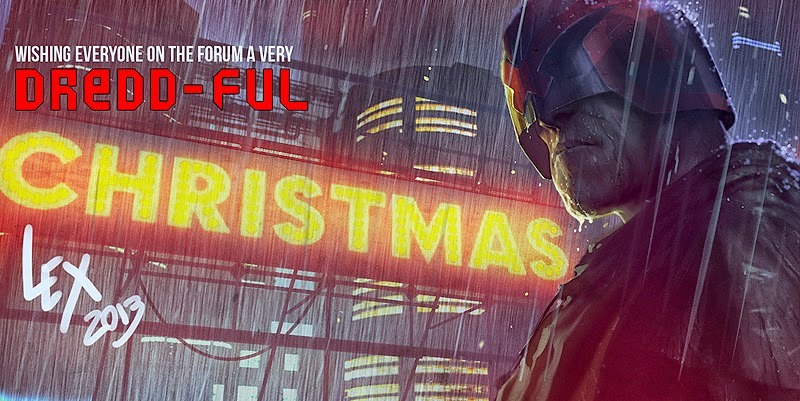 And 2013's Dredd, wow! 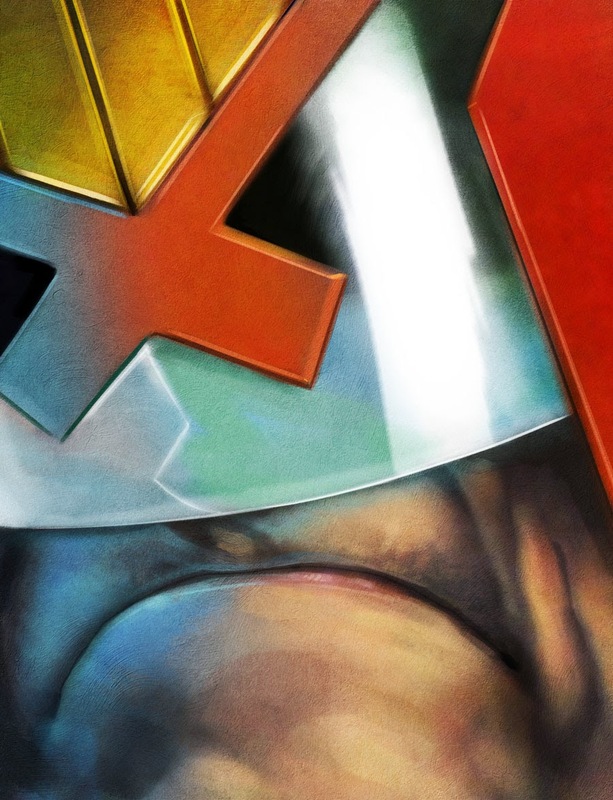 Did I say I'd love another Dredd cover Thargy? 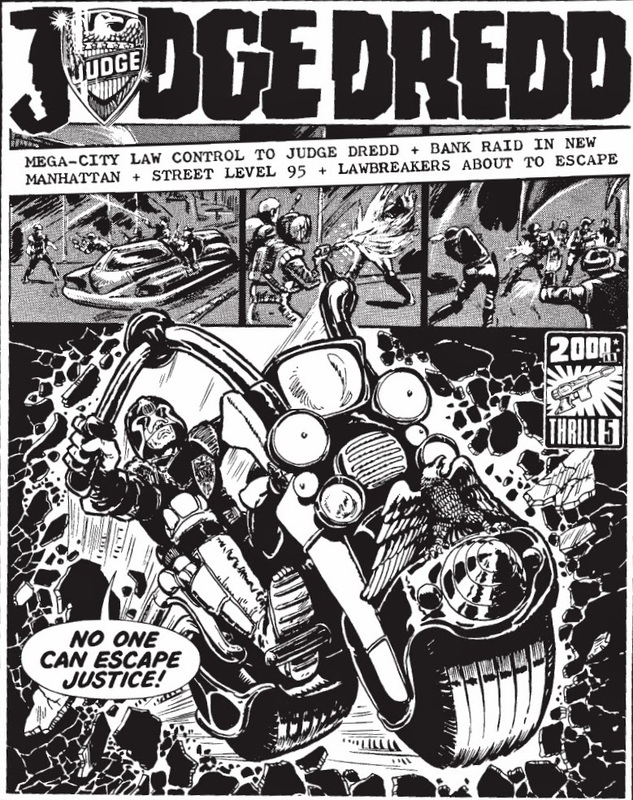 Dredd goes to Des O'Connor? Giant thanks to Alex (and Flint!) for sending the images and for being all round smashing fellas!